Why didn't state officials heed the warnings in Flint? 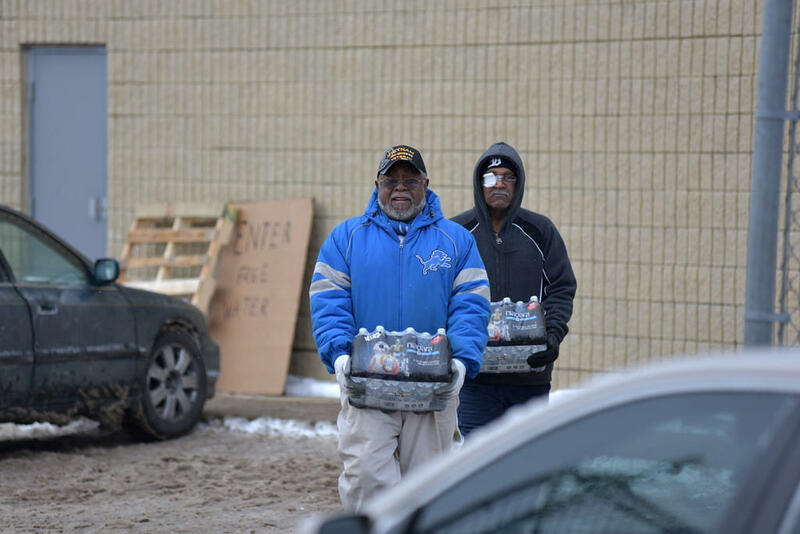 People in Flint are relying on bottled water while officials try to figure out how to fix the tap water. In his State of the State address this week, Governor Rick Snyder apologized to people in Flint for the water crisis. The governor said he would release his emails related to Flint. Those emails came out late yesterday afternoon. In general, the emails didn’t divulge anything big. They pretty much underscored what’s already been revealed. That the state didn't recognize the severity of the problem, and downplayed or dismissed the warning signs. Then-MDEQ Director Dan Wyant at a press conference last fall. This all blew up last fall when state officials stood in front of a sign that said, “Taking Action on Flint Water.” As part of his action plan, the governor appointed an independent task force to look into what went wrong in Flint. The task force placed most of the blame on the Michigan Department of Environmental Quality. And in his State of the State address, Snyder placed blame on the people who work for him. He said his office asked state agencies about the quality of Flint water, test results, and blood testing last July. To sum it up, Snyder said he was getting bad information from his employees. Could MDEQ's work culture be at fault? This minimalist approach to regulatory and oversight responsibility is unacceptable and simply insufficient to the task of public protection. It led to MDEQ's failure to recognize a number of indications that switching the water source in Flint would—and did—compromise both water safety and water quality. For example, the MDEQ did not require Flint to treat its water to prevent lead from leaching out of the pipes into people's tap water. In response, the task force said a “culture change” is needed at the MDEQ. Gov. Snyder delivers his 2016 State of the State address on January 19, 2016. Snyder seemed to address this in his speech. He said he wanted better communication inside his government. We wondered how you make people feel comfortable enough to speak up when there’s a problem. David Mayer from the University of Michigan’s Ross School of Business studies ethical issues in businesses and organizations. Mayer says typically, when someone speaks up in an organization, it doesn’t go well for them. We saw that scenario play out during the Flint water crisis. One of the people who uncovered what was going on in Flint was from the Environmental Protection Agency. Miguel del Toral warned his superiors back in April that something was wrong in Flint. He told them lead could be getting into the water. He also warned regulators here in Michigan. But the state didn’t listen to those warnings. In fact, MDEQ spokesman Brad Wurfel called del Toral a “rogue employee” – a comment for which he later apologized. It took another five months before the state told people that their water was unsafe. "A few stories about someone who speaks up and getting terminated; that's very costly to a large organization." That comes back to what ethics professor David Mayer talks about: If you want to have a place where people can openly point out problems, you have to reward those people when they do. He says you have to praise them, and then you have to do something about the problem that the employee brought up. Mayer says this attitude can't just come from the governor. "All different departments in the government ... have to really buy in to this idea that what they're doing is really important. It's a great public service, and they need to do it to the best of their ability, and that involves having all the information that they need, so that they are actually implementing practices to get people to speak up, and that it goes well for them afterward," he says. "A few stories about someone who speaks up and getting terminated; that's very costly to a large organization." Chris Grobbel worked for the Michigan Department of Environment Quality in the mid '80s to the early 1990s. Today he is a environmental consultant, and a faculty member at Michigan State University. When Grobbel heard Gov. Snyder call for a culture change within his government, it rang true with him. "There's a sense of disconnect between the agency and the public, number one ... and it's difficult to paint with a broad brush, but there's a great deal of arrogance that I have faced, even as an expert ... a great deal of 'expert-ism,' if I can coin a phrase," he says. "And really a culture that tends to be insular and tends to always push any kind of a challenge of findings or determinations. And then if there are data that can't be argued away, then there's often an arguing of the methods to capture the data." Grobbel is still in contact with current MDEQ employees today. He says the culture is definitely not one of openness and sharing. And he says that many people are afraid to speak out in the department. "A number of my cohort have retired or are soon to retire," says Grobbel. "And I saw a change maybe 15 years ago, where good people with good minds and good hearts in that position trying to make a difference started to put their heads down, started to not make statements and really just ride it out until retirement." Grobbel says there's a lot of work to be done within state agencies to regain the trust of the employees. "It's way, way overdue for the DEQ to sit back and make some changes ... no doubt about it." EPA Administrator Gina McCarthy sent a memo to all staff instating a formal policy, effective immediately, on elevation of critical public health issues. It includes specific parameters for staff to elevate critical public health and/or environmental issues so that the agency can properly assess them and respond at appropriate policy and governmental levels. We'll have to watch to see what kind of formal changes Gov. Snyder calls for. One former state employee who reached out to us said he could start by revoking restrictive and punitive work rules some state employees are forced to sign. Barbara Billings was a health care surveyor for seven years with the Michigan Department of Licensing and Regulatory Affairs. She left her job there last June. Billings said employees there were made to sign a "work rules" statement that spelled out what was expected of them. Demonstrate appropriate behavior toward supervision. Refrain from insubordination including any action or failure to act, which shows an intentional disregard for authority, such as a refusal or failure to follow supervisory instruction, direction, or a direct order. Not make false or malicious statements concerning the Department, its employees, other State employees, or members of the public. Billings says these kinds of rules quash information sharing. "This is intimidating and decreases the likelihood that a concerned employee would go above their immediate supervisor, let alone to the governor, to raise concerns," Billings wrote in an e-mail to us. Soon after Flint switched its water source to the Flint River in the spring of 2014, people in the city started showing up to meetings with brown jugs of water. They protested. They picketed. GM stopped using the water in its Flint engine plant. There were boil water advisories. The city added so much chlorine to disinfect the water that a by-product called TTHM reached unsafe levels. And then, almost a year after residents complained about the taste, look, and smell of the water, came the warning from EPA expert Miguel del Toral that lead could be getting into the water. But the people in charge continued to tell Flint residents that the water was safe. And several state officials tried to discredit the people bringing them this information. "Motivated reasoning" and poor organizational culture at play in Flint water crisis? David Mayer said this kind of reaction is human. Psychologists call it "motivated reasoning." People often try to come to a particular conclusion when they get information. "Usually we want to come to a conclusion that helps us feel good about ourselves – that is in line with our beliefs, our own values, and oftentimes our own self-interest," he says. So even though people were warning state officials about the water, Mayer says those officials are motivated to not heed those warnings. "They might not have taken the threat as seriously, because then they would have had to admit that some other action could have led to harm to people," says Mayer. "And that could be challenging internally to them." Mayer says admitting that a decision that you made harmed others isn't easy. "I think oftentimes it can create a perfect storm where we're not very receptive to information that might've suggested that we've done something bad," says Mayer. "It's very hard to take that information in in a non-defensive way." But former employees of the state say it goes beyond personal psychology. They say the culture within the state is not one where sharing is encouraged. Flint is majority-black, and more than 40% of its residents live below the poverty line. This question comes up a lot: Would this have happened in Birmingham, or in Grand Rapids? When Mayor Karen Weaver was asked this week whether race and class had anything to do with the Flint water crisis, she said it was "part of the problem." "This has been going on for almost two years, and the community spoke out about this shortly after the switch was made to the Flint River water and nothing was done," said Weaver.